One of the most bankable names in the history of Honda, the Civic is one great package when it comes to offering a blend of style and practicality in one single package. The new current tenth generation Honda Civic is one sporty and beautiful vehicle to look at, with the coupe-like profile and swanky looking headlamps and tail lights generating a very good first impression. On the inside too, things are sporty as well as elegant at the same time, with a feature-rich low slung cabin evoking a great sense of driving appeal. The Civic can be fetched in two petrol engine options - the 1.5-litre turbocharged petrol puts up 173 PS of power and 220 Nm of torque, while the conventional 1.8-litre petrol unit generates 141 PS of power and 178 Nm of torque. The CVT gearbox is the only transmission unit offered with both the engine options. Have a question on Civic? Civic is available in 5 different colors - White Orchid Pearl, Crystal Black Pearl, Modern Steel Metallic, Lunar Silver Metallic and Dark Ruby Red Pearl. Watch latest video reviews of Honda Civic to know about its interiors, exteriors, performance, mileage and more. The latest generation of the Honda Civic, launched back in 2016, needs absolutely no introduction. And yes, this new generation Civic FC (as it is called) does turn out against the Ford Focus, Mazda 3 and the Volkswagen Jetta, but makes for a better C-segment sedan as there aren’t many other cars in Malaysia that are close to perfect. Honda can proudly say that the previous nine generations of the Civic sedan have pulled off all the challenges pretty well and has made its forte in two main parameters - killer looks and a turbo engine under the hood. And since, these two key elements are everything that Malaysian customers look for, the 10th generation of the car is exactly the same. Dating back to the past, Honda carries a wonderful history of putting its competitors to the dust in Formula One races with small capacity turbocharged engines that made humongous power. And the same formula of turbochargers has found its place in the Honda Civic for a very long time. The seating of the car is quite squishy and may become a little uncomfortable on long tours. However, barring the seats, there are not many things inside that you will have a fuss about. The center console of the interior looks utmost attractive with a big 7-inch screen on the center and a full LCD display on the driver’s console behind the steering wheel. The digital meter is very informative and provides feedback from the engine in the best way possible. The screen on the dashboard is Apple CarPlay and Android Auto ready and can start the system as soon as the two connectivity is officially launched in Malaysia. The smartphone connectivity is a part of the center console right in front of the driver and can be used to take phone calls and also route music through the smartphone. There are AC vents for both rows that have automatic climate control on them. The layout is quite spacious and the driver’s seat is 8-way electrically adjustable. Also, the boot space is quite humongous with up to 519 cargo hold space. Further, there are small storage compartments all over the interior cabin, which makes storing up essentials in an organized manner easy. The 10th generation of the Honda Civic is almost like an evolution when it comes to the styling and design. It is built on a bold and sleek silhouette. When you look at it, the first impression it gives is the dynamism appearing from its short and wide stance. Up at the front, there is a thick strip of chrome passing over the grille section, which joins the pair of sleek LED headlamps. The car is offered with two different wheel sizes - the 1.8-litre model gets 16-inch wheels while the turbocharged models get 17-inch wheels. There are some more interesting design cues at the rear end. The rear gets a low receding roofline and boomerang-shaped rear tail light. There are some sharp body lines, which merge into the body quite seamlessly. The wheel arches are bulky and prominent while having almost zero body cladding. The rear spoiler on the boot lid is just an icing on the cake and entices the way the car looks further. The lower bumper on the front end is quite rugged and gets a lot of contrasting black-colored inserts. The Honda Civic FC carries the legacy of having a small turbocharged engine under the hood. The sedan is offered in a total of two engine options. Both the engines have an in-line four-cylinder setup. The bigger 1.8-litre i-VTEC engine is modest among all and makes a maximum power of 141 PS at 6,500 revs per minute along with a peak torque of 174 Nm at 4,300 revs per minute. The other engine is a smaller 1.5-litre VTEC unit with a turbocharger working alongside. And it is this turbocharger that enables the engine to make a maximum power of 173 PS at 5,500 revs per minute and a peak torque of 220 Nm between 1,700 and 5,500 revs per minute. The power is sent down to the front wheels via a CVT (Continuously Variable Transmission) unit. Interestingly, both the engine trims boast on a top speed of 200 kmph. However, the turbocharged car can hit an acceleration of 0-100 kmph in just 8.2 seconds, while the naturally-aspirated version can do it in 10.4 seconds. The acceleration is smooth and the engine is quite low on sound, despite having a good grunt, especially the turbocharged model. 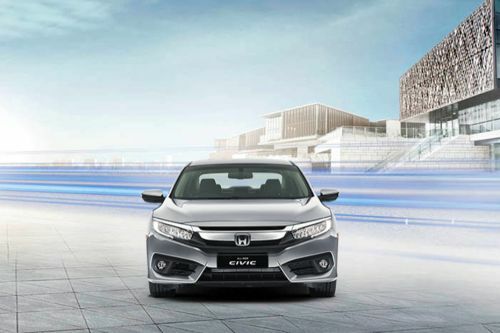 While speaking of the safety, the new Honda Civic has almost all the features on offer as any other premium sedan. To start off with, while you are ascending on a recline, the HSA (Hill Start Assist) prevents the car from rolling backward when you release the brake in order to apply the accelerator. While you are on tight corners, the presence of a VSA (Vehicle Stability Assist) system prevents under-steering or over-steering while on the move. Not only these, the Honda Civic has some amazing safety features that are not offered in many cars as of now. The walk away auto lock detects if the driver has forgotten to lock the car and walks away. In such cases, the car auto locks in 30 seconds or if the driver has walked two meters away from the car. Some other primary safety features include six airbags for the driver, co-driver and also on the side curtains. There is another feature that is not very common among cars in this category. There is an auto dim rear view mirror, which senses the glare from the light of the car behind and dims the mirror so that it does not affect the driver’s vision. What are the Safety Features Available in Honda Civic?